Delores H. arrived to Cortlandt Healthcare after a stay at Hudson Valley Hospital Center with a diagnosis of an abscess liver, muscle weakness, paraplegia, and essential hypertension, which caused her to have a PICC line in place and a JP drain. At the age of 83-years-old, Delores H. was living alone and needed help gaining her strength back during her recovery. During her stay Delores H. received therapy six times a week and made great progress. Upon entering our community, Delores H. had difficulty walking and came in walking a total of 60 feet. At the time of graduation and her discharge home, she was up to 350 feet! Throughout the weeks, Delores H. was able to maintain good balance while standing up without any support and eventually continued on and graduated at the highest practical level for her therapy. 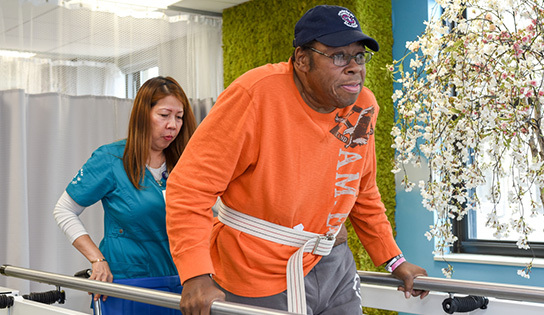 Delores H.’s physical and occupational therapy teams worked hand and hand to ensure she knew all the safety precautions in order to enhance the best quality of life for her. We are proud of Delores H’s recovery to return back home. We wish her the best of luck and to keep up the great work!